The VTech Chomp and Count Dino asks the user to feed it certain foods, which are provided on little pucks with an image of the food. The child is supposed to put the pucks into the dinosaur’s mouth and they then fall into its stomach where the kid can retrieve them. He also loves watching us tow the dinosaur by the attached pull string. …more on that later! Our son loves taking the little “food” pucks out of the compartment and he tries to feed the dinosaur. At 13 months he doesn’t know the difference between the pucks, and therefore doesn’t follow its instructions, but he is starting to become successful at getting the pucks into the dinosaur’s mouth. It took him a few weeks to understand that he really needs to push the puck through, as it doesn’t just easily slide through the hole (the puck needs to trigger a small switch inside the mouth so that the toy responds). 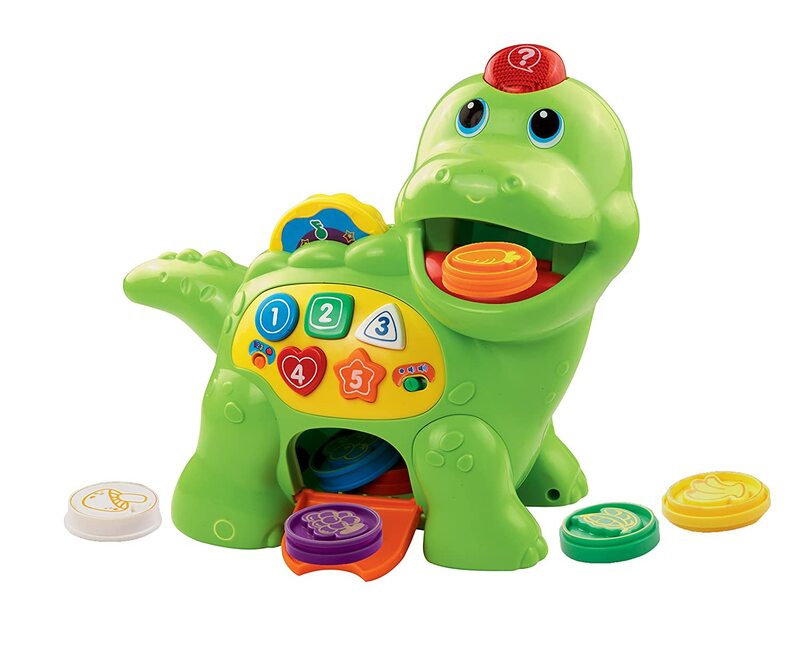 My son really enjoys this toy and he has spent a good amount of time sitting and playing with the pucks, putting them in and taking them out of the Dino’s belly. He grew so attached to this toy, that when he would play with it he would hold the pull string in one hand while feeding the dino with the other. He was so insistent on not letting go of the string that he took his first 10 steps while pulling the dino across the room! We were thrilled to say the least. Bonus points for that! Up until that moment he had really only been walking while holding onto our hands, even if it wasn’t needed. I think it was a security thing. The string apparently fulfilled that role and now he walks on his own. If only we could keep up! Being a VTech toy, the music is lacking any sort of… musicality. I have decided that VTech puts no effort into creating decent songs and tunes for their toys. They are often out of tune and each song just ends, strangely. This is a bummer since the VTech Chomp and Count Dino seems to sing incessantly. I swear, these are undiscovered songs written by the Shaggs. 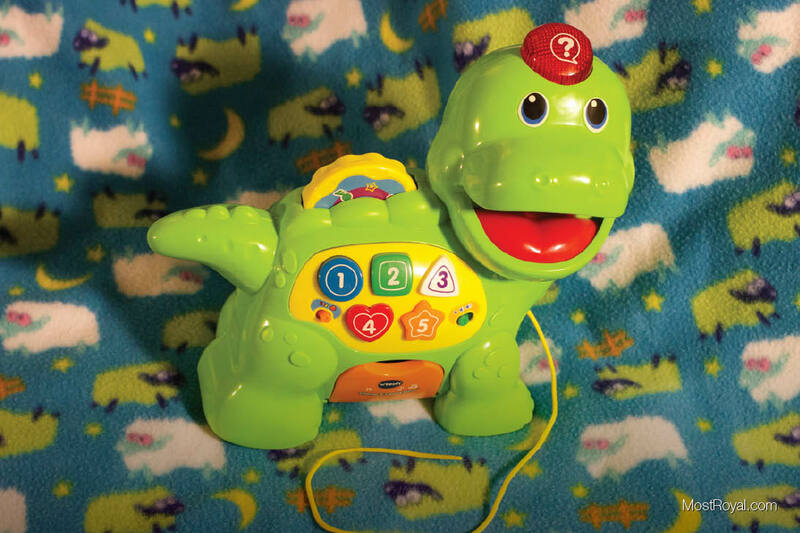 I give the VTech Chomp and Count Dino 4 out of 5 stars because my son really enjoys playing with it, but I just can’t stand the music!